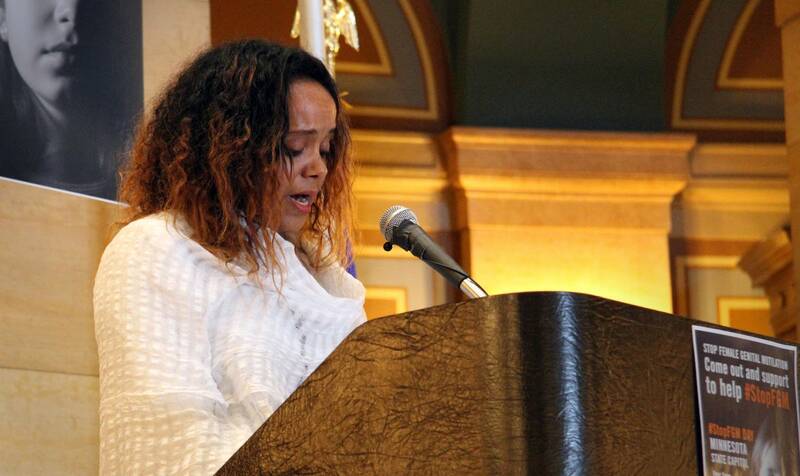 Survivors of female genital mutilation visited the Minnesota State Capitol Monday to share horrific stories of the practice and support a bill that would penalize parents who put their children through the procedure in Minnesota. The event was put on by America Matters, an organization that describes itself as "an advocacy organization dedicated to safeguarding the American way of life." In addition to a Minnesota woman who shared her story, the group brought two women from Virginia and Illinois to share their experiences. One of them was Netsanet Mengistu. "I was 10 years old when I was cut and I remember everything," she said. "The women were cooking a big feast and there was a celebration going on but I didn't know why." When Mengistu asked her father what was happening, he told her the woman visiting was "here for you. For your future life. To make sure you get a good husband and stay a good girl." Her recounting of the story, filled with tears and gasps, included a detailed account of what happened that day. She said she shared it because she wants everyone who has a hand in allowing the procedure to be held accountable. "When I sat down, my hands were tied. I was blindfolded. Then the cutter forced my legs apart. I tried to get free but couldn't," Mengistu said. "I screamed, crying, and begged them to stop. It happened 27 years ago, but I live it every day." The GOP-backed bill, introduced by Rep. Mary Franson, R-Alexandria, made its way to the Minnesota Legislature last year after reports that two Minnesota parents took their 7-year-old girls to Detroit, Mich., to get the procedure done. "How are the parents not held responsible and how is it that at least one of the children was allowed to go home where this abuse took place?" Franson asked. "That's when I realized that Minnesota law is silent on the parents participating in this violent act." Several individuals, including the doctors and parents, are now facing charges in the case. The procedure is already illegal in Minnesota, but the proposed bill would create a new felony crime for parents who knowingly allow it to happen. The bill passed the House last year with four opposing votes. Sen. Warren Limmer, R-Maple Grove, assured attendees of the Monday event that the measure would pass the Senate, noting that "it recognizes rights of parents but also the protection of little girls." But some in the Muslim community have concerns that the bill would separate families without proof that the mutilation is happening. Fartun Weli, founder and executive director of Isuroon, a nonprofit that helps Somali women build self-sufficiency, called the effort "a witch hunt" because there is already a law on the books. Female genital mutilation was an old cultural tradition that was not brought to the United States, she added. "Who is protecting the rights of these girls while everyone is randomly checking them out?" Weli asked. "They're refugees, they're already scared. And so this bill is actually looking for a problem that doesn't exist and is targeting our community." Weli has been lobbying against the bill. She said she's already heard from families who reported their daughters were checked for genital mutilation. Weli said the bill would create unnecessary checkups and could lead to unintended consequences. Although Franson and Limmer said they're confident a bill against female genital mutilation will pass, they said they're not sure yet what the final language will be.